The emailer was from Amphion-les-Bains over on the French side of Lake Geneva. Not. He was from the Finnish Amphion. "If your time table allows, now might be quite the juicy moment to peek into our pro(sumer) gear. Maybe the most popular thread ever (350'000 views in the past year or so) on the most important pro discussion forum Gearslutz went gradually Amphion starting on page 72. After times of feeling quite helpless in trying to teach hifi folks what I feel this great hobby is all about, the feedback from the pro community now builds faith that we are exactly on the right track. The pros get it quickly. It is about seeing deeper into your music. Feeling it closer and appreciating its subtle movements and changes. It is about the highest amount of resolution and time/phase coherence which ensures the one and only thing that matters: the transfer of emotion. I am hoping that the hifi side will embrace new things as well. It just seems to take a bit longer. So many things are exciting for the modern audiophile. Digital technology is maturing, high(er) res streaming is coming, DACs get cheaper and better, vinyl is back. Maybe the most exciting thing for me personally is the realization of a childhood dream. Since 14 I had a dream of hearing the undiluted truth i.e. exactly what the mastering engineer hears. Today it is reality. Fulfilling one's dream is rare. Being able to share it with others is priceless." "As we gradually manage to remove all the problems with the signal, there no longer is any need to run it through a prettifying filter. Speakers with an altered 'more musical' frequency response, which during the days when we were still learning the ropes of digital made our music sound better, are no longer needed. As our source signal gets better, it quite often gets richer, more robust and lush sounding too. I strongly believe this means that one no longer needs any hifi filter in the speaker. There is constant talk about the downfall of the music industry. That's absolute nonsense. The new generation is using a fresh approach, finding new better tools, moving past deadly compression etc. For an audiophile of average age, chances are that the best music in the world has already been recorded. It tends to be the music of their youth. Today they can hear it like never before. Just choose your format: 24-bit high resolution. DSD. Pressed vinyl. Even tape! 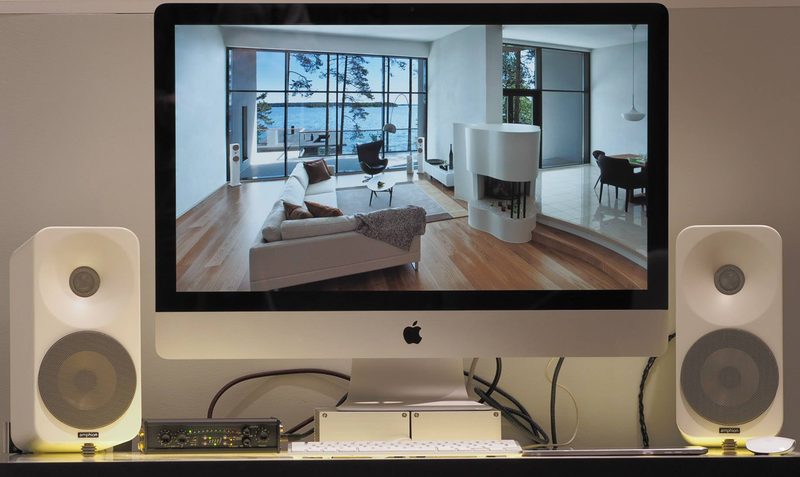 "Naturally better sound reproduction is different things to different people. Still, I think the downfall of the hifi industry comes from the simple fact that we have strayed too far from the original purpose of recreating the music just as the artist intended. During an intensive 3-year period to share my dream of offering real mastering-quality sound in the comfort of your home, we have worked hand in hand with one of the top mastering studios in Scandinavia. They are widely recognized outside Finland’s borders. For example Rammstein works exclusively with Chartmakers’ Svante Forsbäck. 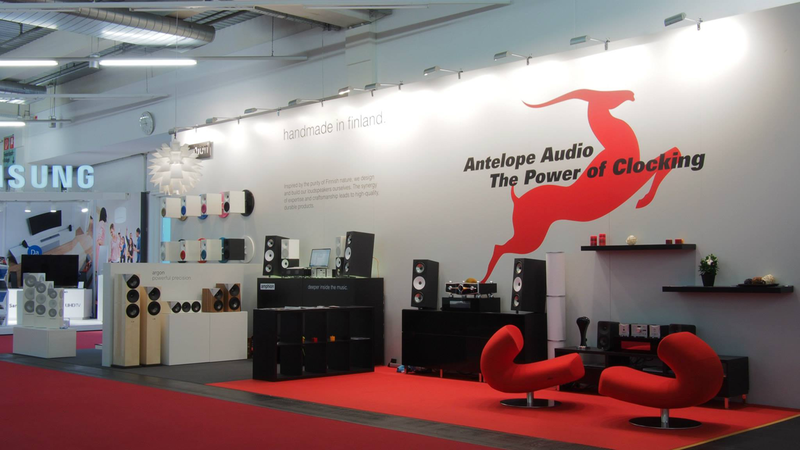 ...Amphion pro speakers at Munich Highend 2014. "Today an audiophile serious about hearing exactly what the mastering engineer heard can purchase the same or similar gear. Antelope or Weiss converters are widely used on both sides. High-quality amps are widely available. Take your pick. 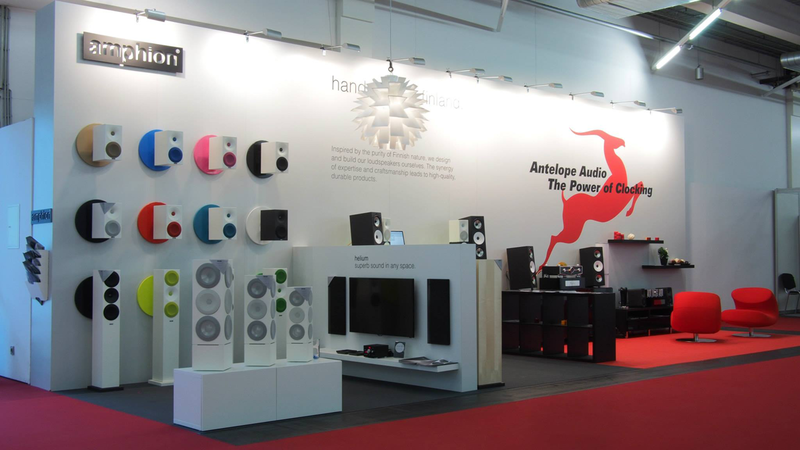 A few audiophile speaker companies have been very successful showcasing that their speakers are used during mastering. So buy the same stuff and press play? I am afraid it doesn't quite work like that. A mastering engineer has something which most audiophiles can only dream of: a professionally built room with finely tuned acoustical properties. This leads us to perhaps the most important yet most overlooked aspect: the room/speaker interaction. It is amazing how much attention something of lesser importance gets in relation to those things which truly matter. Audiophiles talk about cables. Pros talk about plug-ins. Nobody talks about making your speakers behave better in different types of rooms."